GALWAY FORWARD SEAN Armstrong has announced his retirement from inter-county football for the second time in his career. The Salthill-Knocknacarra ace previously retired in 2014 after losing his appetite to play county football, but he rejoined Kevin Walsh’s squad for the past two seasons. The 32-year-old lifted the Connacht title this year and the Division 2 league crown in 2017. His final appearance in the maroon arrived in Galway’s All-Ireland semi-final loss to Dublin last month. He confirmed his decision to step away in an Instagram post this morning. “To all the managers, backroom staff, players and fans,” he said. “It has been a privilege to play for you and alongside you. Armstrong won three Connacht titles in total with the Tribesmen, while he helped deliver All-Ireland U21 success in 2005. Email “Three-time Connacht medalist retires from Galway duty for the second time”. 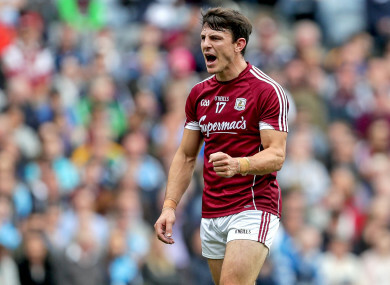 Feedback on “Three-time Connacht medalist retires from Galway duty for the second time”.